There is trouble in Vladimir Vladimirovich’s house. Might this indicate the beginning of a colored revolution? A colored revolution in Russia is Putin’s worst nightmare and the reason he formed the National Guard. Putin chose security over freedom and oppression over liberty. His Russia is considered one of the most oppressive governments in the world. Corruption is not only rampant, but it is also considered acceptable by the Oligarchs. Ingushetia is 1,750 kilometers from Moscow, perhaps the distance makes the people feel removed from Moscow and empowered to protest. Not so much, it seems. Ingushetia is far from Moscow. 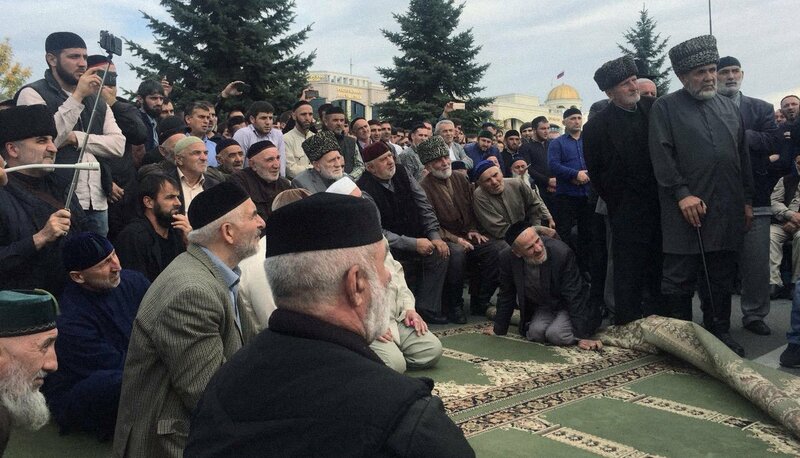 On October 4, as Internet service suddenly started failing in major towns and cities across Ingushetia, protesters flooded the square outside the parliament building in Magas, demonstrating against the ratification of a new border deal between Ramzan Kadryov and Yunus-bek Yevkurov. At first, only about two dozen people joined the rally, led by local human rights activist Magomed Mutsolgov. According to BBC reporters on the ground, police and National Guardsmen conversed with protesters, while urging journalists to leave the square. Before long, however, the crowd swelled to several thousand people (the BBC estimates there were roughly 2,500 demonstrators on Thursday). According to anecdotal reports, many of the protesters wanted the border agreement canceled and Yevkurov to resign. Yevkurov eventually tried to address the crowd, but someone threw a plastic bottle at him, prompting his security guards to unload several long bursts of automatic gunfire into the air above the protesters, who were largely undeterred by the show of force. “Let them send us to Kazakhstan again, if they want to take out land!” one woman told the BBC, referring to the 1944 Soviet deportation of the Chechen and Ingush populations. Police fire into the air outside Ingushetia’s parliament, and evacuate the building of deputies. After Yevkurov fled the square, the crowd soon got wind of a new development: Ingushetia’s parliament had reportedly ratified the border agreement, despite a ruling by the republic’s Constitutional Court hours earlier stating that only a popular referendum could finalize the deal. Later in that evening, Yevkurov announced that he had signed the parliament’s ratification. Appealing to the public in a video posted on Instagram, Ingushetia’s leader asked people to go home and stop demonstrating. “The fact that I’ve created comfortable conditions for you over the past 10 years as head of the republic and done everything to make you feel like a democratic society doesn’t mean you can violate the laws so brazenly and embarrass our republic,” Yevkurov said. Members of parliament soon showed up at the protest, however, claiming that 15 of the legislature’s 24 deputies had actually voted against the border deal, arguing that the official results were falsified. Yevkurov, meanwhile, suggested that the demonstrators form a delegation of 10-15 people to meet with his office, but the protesters rejected the offer, insisting that they only want to speak to members of Ingushetia’s parliament. As these negotiations were underway, two Sukhoi Su-25 fighter jets reportedly circled the square. Demonstrators then started pitching tents and gathering benches to accommodate older people in the crowd. Roughly 500 people (including several women and children) spent the night in the square. It was cold and rainy, but protesters built fires to stay warm and locals came with food and blankets. By the next day, there was a whole field kitchen up and running. On October 5, rumors started circulating that a local government agency had threatened to fire any employees who attended the rally. According to the news agency RIA Novosti, religious leaders, meanwhile, drafted a petition calling for Yevkurov’s resignation. Speaking to the BBC’s correspondents on the ground, demonstrators expressed confusion about why Russia’s national television networks aren’t reporting from the protest. People in the square reportedly have many theories about why Yevkurov is defending such an unpopular agreement, speculating that he might be profiting from it illicitly somehow, or that the deal is meant to secure Chechen leader Ramzan Kadyrov’s support for him in Moscow for another term as head of Ingushetia. Protesters apparently believe almost unanimously that Kadyrov’s interest in the borderlands has to do with Chechnya’s recent acquisition of Chechenneftekhimprom and expectations that the Sunzhensky District contains oil deposits. Security forces practice Friday prayer. In tweets on Friday, October 5, BBC correspondents Ilya Barabanov and Liza Fokht reported that local Ingush security forces were praying alongside demonstrators and shielding them from bused-in National Guardsmen from “the Urals” and Dagestan. “People here are largely convinced that the Ingush security forces won’t let these guys break up the crowd,” Fokht wrote from Magas.